I watch my sugar intake but still like to enjoy a sweet treat on occasion. Therefore, I was very excited to discover Nonni’s THINaddictives artisanal cookies. These delicious cookies were created by Nonni’s which is the maker of the #1 selling biscotti cookies and THINaddictives are a wonderful addition to the line-up. Nonni’s THINaddictives are now available in new flavors such as Banana Dark Chocolate and Blueberry Oat as well as Cinnamon Raisin, Pistachio and Cranberry. THINaddictives reminds me of the classic biscotti and is made with real ingredients. One serving has three cookies so I am really satisfied after enjoying THINaddictives for a sweet snack or as a dessert without the guilt. It goes perfectly with a cup of coffee or tea and my kids enjoy dunking it in a glass of cold milk. What makes these new cookies so exceptional is that a serving has only 6 grams or less of sugar, is low in carbohydrates and has only 100 calories! I sampled several of the flavors and my favorite is the Banana Dark Chocolate Almond Thins which has a rich chocolaty taste that is paired beautifully with fresh banana flavor from the banana chips. I love the crisp, crunchy and slightly chewy texture which is baked into each almond thin cookie. The semi-sweet chocolate chips start to melt when I enjoy this with a cup of coffee and it is mouth-wateringly delicious! 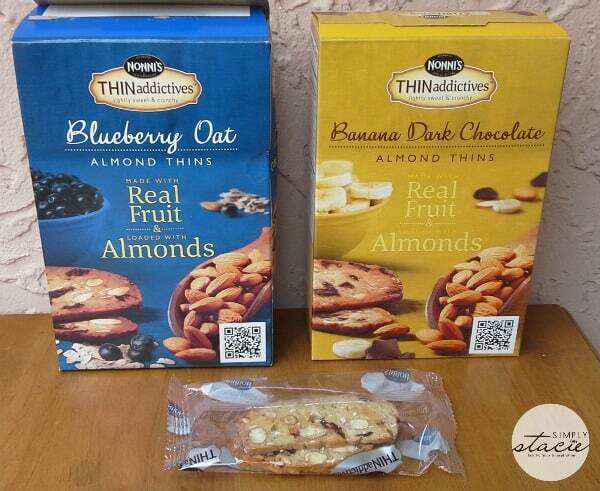 My husband and kids favorite is the THINaddictives Blueberry Oat Almond Thins which have real, whole blueberries and oats which give this a heartiness that is satisfying. It is sweet without being overly sweet and is a nice addition to breakfast especially when on the go. My husband has requested that I put these into his lunch box which is easy to do because they are wrapped in individual services (3 cookies per pouch). Nonni’s THINaddictives are available nationwide at grocery stores throughout the United States. You are invited to visit Nonni’s to learn more about this product line and all of the additional products, news and special offers. I would love to try the Mago Coconut almond Thins. I would like to try the banana dark chocolate. I’m a chocoholic, so I’d love to try the Banana Dark Chocolate first! Yum! I would love to try the Triple Chocolate Biscotti! The triple chocolate biscotti sounds great! I would love the triple chocolate biscotti. I’ve had the cranberry almond thinaddictives and love them…and would love to try the mango coconut thin addictives. I would like the Limone Biscotti. Banana dark chocolate sounds good. I would love to try the Almond Dark Chocolate Biscotti Bites! I would love to try the Very Berry Almond Biscotti Bites. The Cioccolati Biscotti looks yummy! 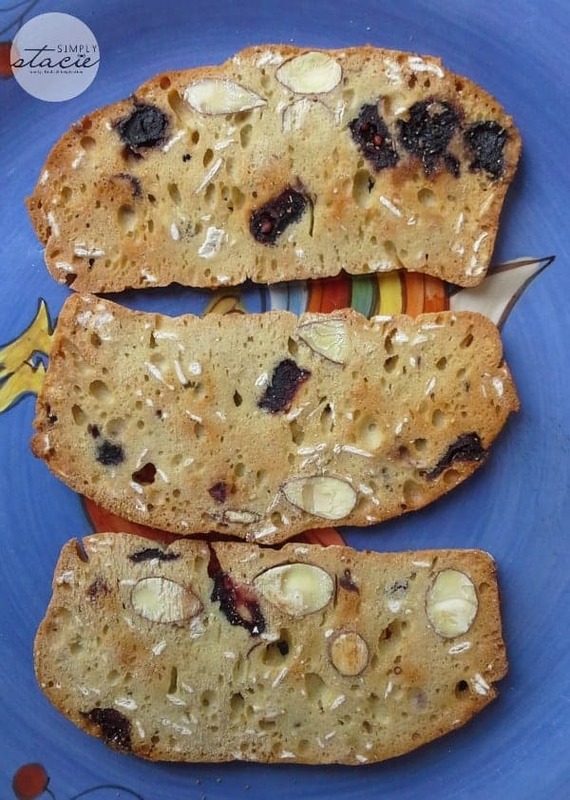 love to try the cioccolati biscotti. I’d like to try the Pistachio Almond Thins. Banana Dark Chocolate Almond Thins sound the best but Pistachio Almond thins sound good too. I would like to try cinnamon raison almond thins. I would like to try the Very Berry Almond Biscotti Bites. I would like to try Triple Chocolate Biscotti. The Salted Caramel Biscotti looks yummy. I think I would try that first. My favorite product from Nonni’s is the blueberry-flavored Thin Addictives. Really excited about trying them out!